Locally-owned Pioneer West Homes swept the 2015 Pueblo Parade of Homes Industry Awards of Excellence for the price category for homes over one million dollars! Awards include Best Kitchen, Best Floor Plan, Best Master Suite, Best Architectural Exterior, Best Interior Design, Best Landscape and Best Overall Home. This year’s Parade Home by Pioneer West Homes is a custom ICF (Insulated Concrete Form) stone and stucco ranch style home with a rustic interior and exquisite custom finishes. 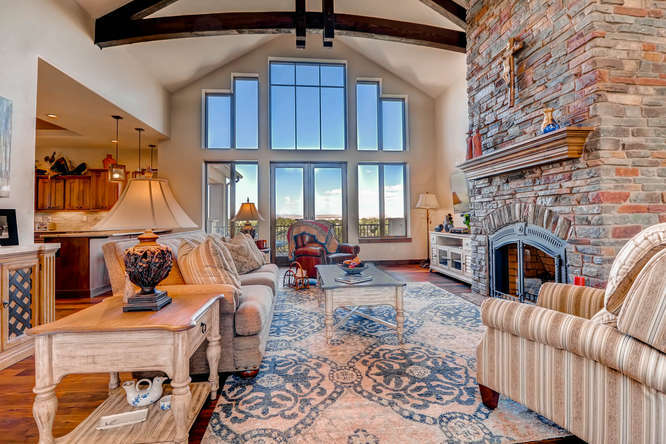 Highlights of the home include a floor to ceiling stacked stone fireplace, wood beams, and walnut floors in the open family room. The spa-like master suite promises to offer the perfect destination for the owners’ “staycation” as they enjoy the custom cabinetry, over-sized walk-in shower, his-and-hers vanities, and tile flooring. The finished lower level features a large rec room with custom walnut wet bar and floating walnut shelves, and walks out to an incredible outdoor, in-ground swimming pool. The craftsmanship and custom features of this home are not to be missed so purchase your tickets at Pioneer West Homes at 35001 Hidden Mesa Road or online at PuebloHBA.org. This year’s show, July 17 – 26th, is open Fridays from 1 to 6 p.m. and weekends from 11 a.m. to 6 p.m. Tickets are $5.00 per person (under 16 admitted free of charge). Unable to attend this year’s Parade of Homes, no worries, you can click here to take a tour! About Pioneer West Homes: The only home builder in Southern Colorado to commit to building 100% of our Colorado Custom Homes to the Energy Star Version 3 Standard, Pioneer West Homes is celebrating its 10th anniversary of building trendsetting and energy-efficient custom homes in Colorado and New Mexico. Pioneer West Homes is the recipient of numerous Parade of Homes awards from the Pueblo Association of Homes Builders and the Housing and Building Association of Colorado Springs.